*This post includes affiliate links. Please see my Disclosure for more information. As a homeschool mom for 7 years, I have heard a lot of things about homeschooling. Many have been positive, some negative, but one common theme is that we have large families. Many of us do, but not all. My comments here will reflect my experiences as a large-homeschooling-family. 1. If your husband is congratulated at church on Sunday by your next door neighbor for expecting your newest child, and you’re NOT pregnant, you might fit the mold of a Large-Homeschooling-Family. Seriously, this happened to us recently. I don’t really know the exact conversation because I was picking up our two youngest daughters at the time, but it made me ponder a few things. Do I look pregnant and so people just assume I am? Is it just expected now, since our daughter is 2.5 and we have 5 children, and we DO homeschool, that we must be expecting another? I don’t know, but this event has given me a new perspective on how other families may see us. 2. If you walk into a restaurant, grocery store, or church, and you can see people counting heads, you just might fit the mold of a Large-Homeschooling-Family. We have had this happen to us repeatedly since our 4th child was born. Something about breaking the family-of-five barrier, I guess. Trust me, I get it. We were a family of 4 for a few years, and then a family of 5 for several more before adding our two youngest. I was just as amazed by families who were able to handle that many children! It’s funny being on the other side now and experiencing the amazement (my own and others’) in a whole new way. And I have often been asked why my kids aren’t in school. A great opportunity to promote homeschooling! 3. If you struggle to find a dining room table that is both large enough to seat your family and fit into your dining space, you just might be fit the mold of a Large-Homeschooling-Family. We needed a new dining table for a couple of years before actually finding and purchasing one. Ours was falling apart but we had two problems. We were about to move, and we couldn’t find one large enough that we loved! Once we made the move across the country we began searching for a farm table. We ended up traveling about an hour away to a wonderful area that has many warehouse-type buildings, offering lots of antique and new furniture for sale. We saw ‘it’ almost immediately upon arrival. We forced ourselves to go through the motions of looking through some of the other buildings, all the while praying that no one would purchase ‘our’ table. After about 2 torturous hours of obligated looking, we went back to find that our table was still there, so we made the purchase. We also found a beautiful bench and some chairs to go along with it. Our table seats 10 comfortably and would likely fit a couple more if necessary. It is great for large families, and works well for entertaining, too! And yes, we DO all sit around it at times to study the bible, complete assignments, draw, play games, or to write. 4. If your doctor’s receptionist staggers your office appointments because they just don’t have that many appointments available at one time, or that many doctors on hand, then you might fit the mold of a Large-Homeschooling-Family. We schedule our dentist and doctor appointments by priority, as well as acording to which child is able to watch the others while mom takes siblings to the appointment. Since we have older children this works well. I also need to think about which siblings get along and which ones don’t as well, to make sure everything runs smoothly while I’m away. 5. If when I refer to Mt. Laundry, you know exactly what I mean, you might just fit the Large-Homeschooling-Family mold. Our laundry baskets runneth over. Exponentially! We go through jeans, sweaters, dirty socks, gloves, pajamas, t-shirts, etc. like there is no tomorrow. If we ant to be able to keep our clothing, and not throw it all away due to mildew, we must do laundry daily. Typically multiple loads. I have assigned my older children to do their own laundry, and sometimes we all fold the ‘extras’ together, and it can still get overwhelming. I am in charge of mine and my husband’s laundry, as well as our two littlest girls’ bedding and clothes, and all towels. The rest of us each wash our own bedding once per week. I wrote a little about Mt. Laundry recently. Need some help with your large family? Here are a few recommended resources meant just for you! Simply click on the link to view the products and/or make your purchase. 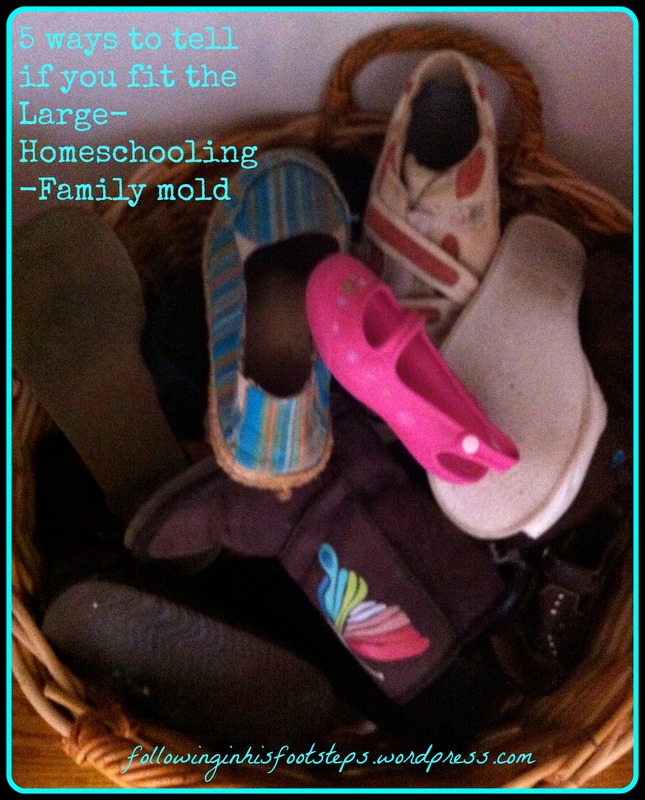 Do you have a list of things that lets you know you are a Large-Homeschooling-Family? I would love to see your list! Please leave me a comment. This entry was posted in Baby, Faith, Family, Homeschooling, writing and tagged homeschooling, large family homeschooling, laundry, studying the bible. Bookmark the permalink. We all went out for a walk the other day in our new neighborhood (we are a family of 9) and everyone was looking at us like we had, well, 9 heads! Nobody said hello to us, I think they were too shocked! Sarah, too funny! Sorry no one said hello. I will admit, I still think people with 9 children are amazing! But when I think about it that is not too many more heads than we already have. 😉 Thanks for commenting. Yes, I believe that’s so! He definitely gives me much grace. Thanks for stopping in to read and comment! Thanks for the smile! We are a family of 8 and we usually get stares. Some are nice and smile, some just stare and frown. I cracked about “Mt. Laundry”. My husband refers to our pile as “Mt. Laundria”. The kids have a great time jumping into it! We have five bio children and are fostering (hopefully to adopt!). We currently have one little foster girl but would be open to a larger sibling set! Another issue we struggle with is the amount of dishes we have. One day, I counted 14 cups from 7 kiddos. 🙂 We have got to come up with a system! Thanks for your post! Aw, Jessica, I would love to foster to adopt. Maybe one day. Praying about that. The ‘system’ we use for dishes was put into place by my husband several years ago, when our two oldest were just 9 and 11. He gave them the job of dishes and I have not needed to do it since! I do supervise and occasionally wash the dishes, but being free of the daily grind of it has been wonderful! My husband enjoys spending some after-dinner time with me and the littlest kids, and the older ones are helping contribute to running the home. Win-win! Try it, you may like it. 😉 Thanks for stopping by, hope you’ll pop in again! When you’re trying to figure out how to fit another child (God-willing) into our already full-of-four-carseats minivan. OR if maybe we can just make two trips to church on Sunday to get everyone there, does that count? 😉 Great post! Love your blog! Thank you, so glad you enjoy your time here! That IS a challenge, trying to figure out the vehicle situation. I hope you don’t have to drive very far to church! We have 1 spot left in our SUV. So far hubby is not eager to fill it. 🙂 Thanks for sharing! The other day someone assumed that I homeschooled my kids because we are a large family with 6 children. I’m all for homeschooling and even tried it one year, but it’s just not for us. I just thought it was strange that they would assume that we homeschool just because we are a large family. Funny! I refer to our piles of laundry as “Mt. Laundry” too. Most awkward things I hear deal with comments about the youngest two being my grandkids. Seems we have that in common then. 🙂 That would be awkward! How do you handle it? Sorry, Betty Jo. It definitely does take some getting used to! With my 12 ages 8-32 and the six grandchildren–two of whom I babysit—ages 2-14 I get funny looks and comments as people try and figure out that MY youngest 3 are younger than 1 of my grandchildren! That’s funny, Julie! I find myself doing the same when I see large families, but I love to see them. Strangely, I don’t really feel like we are *that* large, but I know most folks think so. We are quite small when compared to your family with *just* our 5. Thanks for stopping in to say hello! This made me laugh for the opposite reason. We homeschool and have just two children, 3 and 6 with no plans for more (bio anyhow!) so when we go to co-op or are in other homeschool situations people are always asking me if this is “all!” Feels so funny sometimes that in most all of our social situations I feel odd with the “typical” American family! !